I've had a minor obsession with metallics this holiday season. Okay, a major one. So when I spotted these textured scrapbook pages at the craft store, I knew I had to have them. I began experimenting with a pencil compass, and I came up with a fun metallic Christmas tree. What do you do when you want a Christmas tree and an advent calendar, but you live in a tiny space? You make an advent calendar tree out of paper and and it solves all your problem, that's what! Christmas trees aren't for everyone. They can be pricey when you're on a budget, tricky in a small apartment, and nearly impossible with pets. This year we came up with a super affordable, easy to assemble, clever tree that only requires a wall, a roll of tape, a stapler, dexterous fingers, and about an hour of your time. Right? Right! Let's make one. I love having a tree in my home during the holidays. They're so fun to decorate, and if you're lucky enough to get a real one, the smell is fantastic! Unfortunately, trees and lights and ornaments aren't free. Here are 12 great ways to bring a tree in your home without breaking the bank! We're about twelve days out from Christmas (12 Lords-a-leaping!) and there's still time to get a tree up if you haven't already. 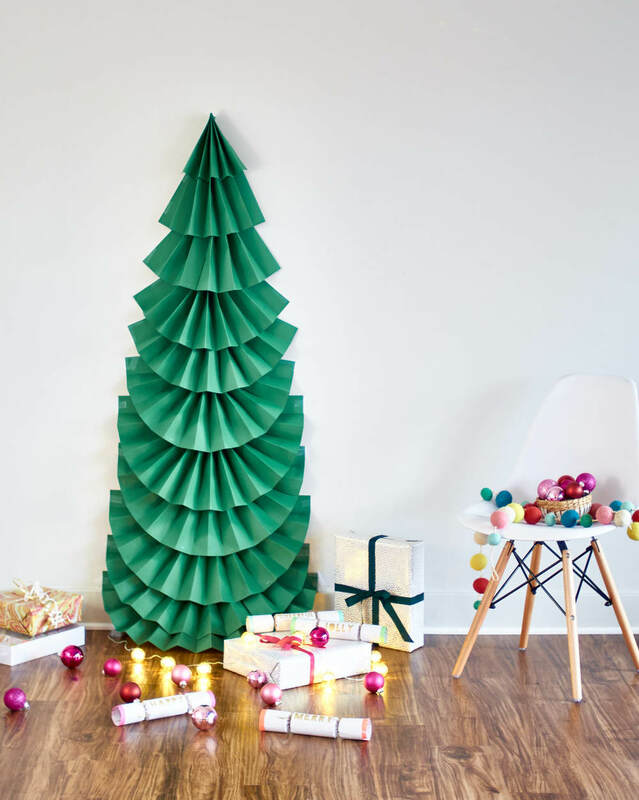 If you don't have the space for a big one, why not make your own artificial tree? Yeah. That's right. It can be done. And with something I never would have thought to use! Well, I've found another must-make project to add to my already full list this holiday season! This Christmas tree wall hanging is the perfect way to add a little holiday festiveness without going crazy. If you like to keep it modern and simple, it's for you too! We've seen typographic string art, abstract string art, and now: Christmas tree string art! If you've got the patience and the wall space (and don't want to take up any floor space), this project's for you. How adorable are these felt tree ornaments?? There's still time to whip up a few for yourself or as cheery little gift toppers! Last holiday season, I had so much fun experimenting with sprayable glitter (see: here, and here, here, & here), that this year, it nearly didn't feel like Christmas unless I busted out the glitz again. But then, when a friend asked if I had any ideas to make some super easy, small woodland-style Christmas trees for a centerpiece, I knew exactly what to do. This DIY tree branch lamp is a unique project that could easily be scaled to your liking (a desk lamp, perhaps?)! Looking to add a little woodsy warmth to your abode? Then you'll definitely want to put this DIY log slice side table to your to-do list! How To: Make DIY Twig Buttons! Okay, before you think "What could I possibly do with a bunch of twig buttons?! ", I have an answer (or five). Ahem. They are: embellish pillows! Embellish gifts and gift tags! Use them on these felt gadget cases! Use them for knitting projects! Turn them into cute magnets! See? There are SO many ways to use them. All jazzed up to make some twig buttons now? Here's how.